AcrossTabs - Easy communication between cross-origin browser tabs. 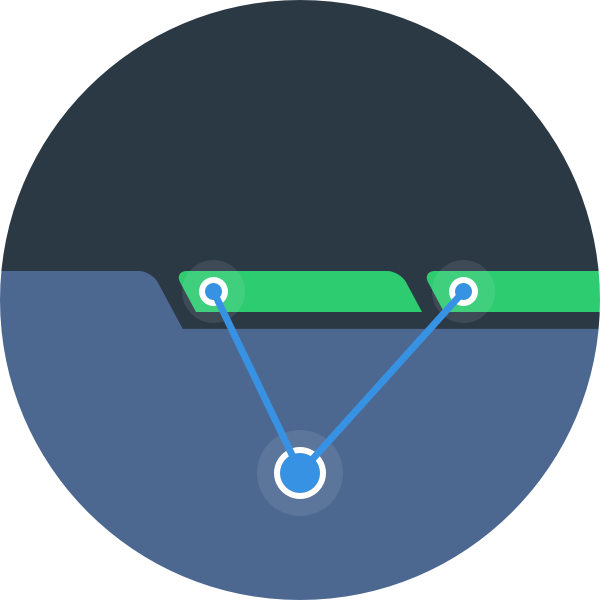 Safely enables cross-origin communication among different browser tabs. Uses PostMessage API for communication. Easy to hook custom callback at various levels. Eg: executing a custom method in Child's tab on receiving a message from Parent tab. Fully fledged API to get information regarding the tabs(Parent and Child tabs) and other communication-related methods. Exports in a UMD format i.e. library works everywhere. Note: Use the desired version of the library in place of 1.0.0. Checkout cdnjs across-tabs. Opener/Parent tab(P) opens up a new Child tab(C). C initiates a handshake with the P tab by sending a postMessage. P acknowledges the request and sends C it's identity i.e. UUID along with P information. 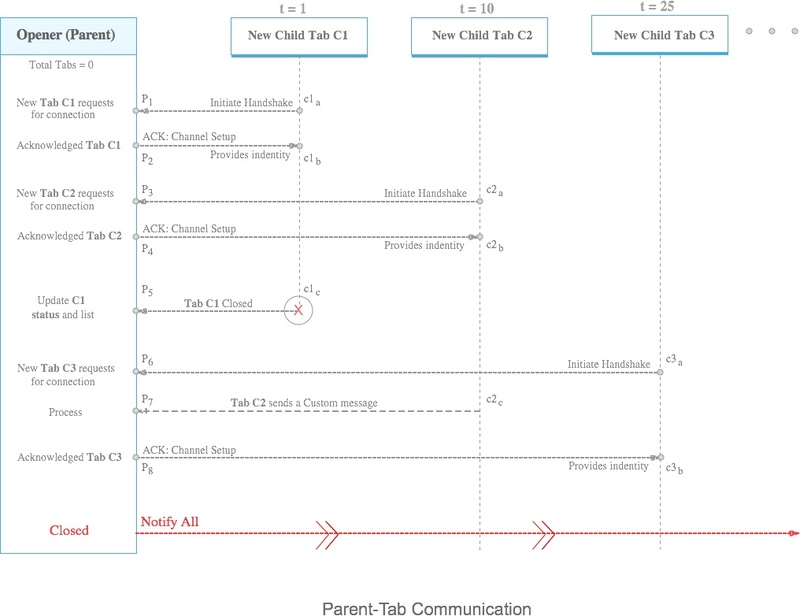 This sets up a communication channel between Parent and Child tab. Now, P and C can share custom messages with each other. Whenever C gets closed/refreshed, P is notified. Whenever P is closed/refreshed, all children of P tab gets notified. Parent(P) opens Child tab(C1) at t=1. c1a - When C1 initiates a handshake with the Parent. P1 - When P receives C1 message. P2 - P acknowledges the request and sends the C1 its identity. c1b - When C1 receives an acknowledgement message along with identity from P.
Parent(P) opens CHild tab(C2) at t=10. c2a - When C2 initiates a handshake with the Parent. P3 - When P receives C2 message. P4 - P acknowledges the request and sends the C2 its identity. c2b - When C2 receives acknowledgemnet message along with identity from P.
c1c - Tab C1 closes. P5 - P is notified about the C1. Parent updates the list. Parent(P) opens CHild tab(C3) at t=25. c3a - When C3 initiates a handshake with the Parent. P6 - When P receives C3 message. c2c - Tab C2 sends a custom message. P7 - When P receives a message from tab C2. It processes it. P8 - P acknowledges the request and sends the C3 its identity. c3b - When C3 receives acknowledgemnet message along with identity from P.
When Parent Tab P is closed, all the opened tabs are notified about it. Create an instance / reference before using. Constructor accepts a configurable Object with the following keys. Example is included in the example folder. Vanilla JS and Vue js versions are there to test out. Note: Run npm install if you wish to run vuejs example since the example needs the vue-js library to work. Refer above section on how to create an instance before hitting API methods. Links / buttons can be given a data attribute: data-tab-opener="name". On clicking, the library finds elements with that attribute and adds disabled="disabled" attribute to that element. The disabled attribute is removed once the Child tab communicates back to the opener i.e. Parent. Though, this method is called internally but can also be invoked(may be within a timer) to be on a safer side. Returns the list of all the tabs. If removeClosedTabs: true is provided while instantiating, it will return only the opened tabs as closed tabs would be removed. Returns the list of all opened tabs. Returns the list of all closed tabs. If removeClosedTabs: true is provided while instantiating, it will return empty list as closed tabs would be removed. Closes all the opened tabs. Closes a particular tab whose id is provided. Sends a same message to all the opened tabs. Sends a message to a particular opened tab. Return id, name, and parentName of the child tab. Sends a message to the Parent tab. Tested in Chrome, Firefox and IE(versions >= 9). Webpack based src compilation & bundling and dist generation. ES6 as a source of writing code. Exports in a UMD format so the library works everywhere. ES6 test setup with Karma, Jasmine and isparta. Test coverage with [Istanbul]() and Coveralls. npm run dev - produces development version(un minified) of the library and runs a watcher to detect file changes. Fork the repo on GitHub. Clone the repo on a machine. Execute npm install and npm run dev. Create a new branch <fix-typo> and do your work. Run npm run build to build dist files and npm run test to ensure all test cases are passing. Commit your changes to the branch. Note: If adding site to the list of sites using across-tabs, please mention where to verify this in the PR description. Having a Queue mechanism to deal with loads of async events. Promise based Parent-Child communication. Will help in sending window-specific data to and fro apart from custom data messages. E2E testing so that the behavior can be tested automatically. Maintaining and adding more enhancements as and when required. Open to everyone's suggestions. Copyright (c) 2017-2018 Wingify Software Pvt. Ltd.